I was born in 1941 in Schiedam, The Netherlands. At the end of the ’60’s I finished my studies (drawing, painting and graphic design) at the evening school of the Rotterdam Academy of Visual Arts. My graphic design (etchings) received highest appreciation. 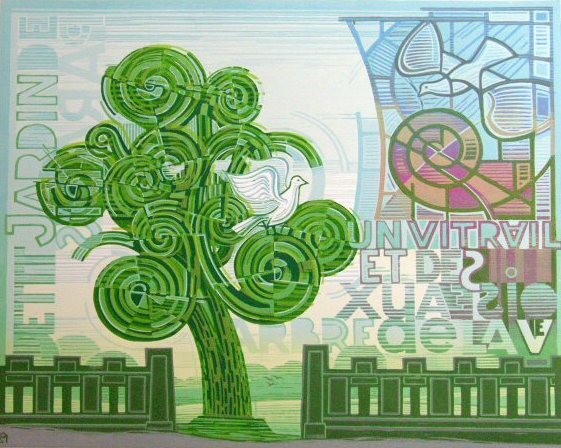 Since 1984 I have mainly specialised in making linocuts. This technique suited me very well. Since 2000 I concentrate on wood carvings in colour. Until August 2006 I was working as a visual arts teacher at a high school in Vlaardingen, The Netherlands. Then I retired. All those years I have very much enjoyed teaching, but besides that I have always continued to also express myself visually. From time to time I have participated in the yearly exhibitions of artists in the Hollandia Gallery of my home town Vlaardingen. Occasionally I have participated in open studio days. In 2009 I was offered the opportunity of a (successful!) retrospective at the same gallery. Tree of life. The tree is a symbol of life, as is the spiral form (starting in the centre and developing outwardly). The Marcevol Abbey (Pyrenees, France) has beautifully welded hinges of double spirals on its entrance doors. The spiral form is present in countless forms of life, for instance in a shell like the Nautilus. I always have the inclination to enhance the image with verses. Letters also can be called symbols and words ‘speak’ for themselves. The titles used here from the composer Olivier Messiaen have something poetic about them. The whole portrays a marvellous world with clear light, light of life, and birds in the tree. The bird in the right upper corner comes from above. Is it the Spirit who descends to this paradisiacal spot? ‘Changes in urban development’ would be a correct motto for many of my works. Throughout the years I have made many topographical works, e.g. of the construction of the rail tunnel in Rotterdam or a building project in Vlaardingen. At the end of 2007 a book was published in my native town Schiedam with drawings, prints, watercolours and gouaches that only had the town as their subject. In this Groot Schiedams prentenboek four of my early topographical drawings were included. These drawings derive from the ’60’s. At that time the old town center of Schiedam with all its picturesque sites still offered many possibilities. ‘Objects’ are another source of inspiration. I have for instance made a series of lino- and wood carvings of antique typewriters. In many of my still lives stones and shells appear besides ordinary things that we take into our hands every day. These things express something about ourselves, who we are, what is our inspiration. From around 1980 I have made end-of-the-year-prints for my friends and family. In these often a religious aspect is present: in the context of Christmas I have dealt with themes like the renewal of our world or the eternal battle between good and evil. Also vacation memories (especially Romanesque churches) are among my favourite subjects. 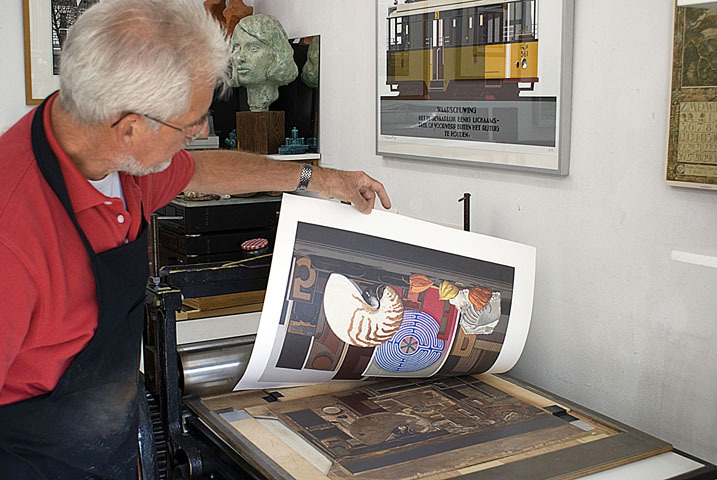 Wijk bij Duurstede, The Netherlands, a wood carving from 2009, printed in 15 colours from 1 wood plate. This is just a striking town view. At a certain point the design drawing becomes the ‘work drawing’(which can also partly come from the /computer). I put this work drawing in mirror image on the wooden plate. While at work, I decide how much colour I will add. Until now I printed the bigger prints (about 45 x 60 cm) with one or two plates in the ‘lost form’ technique. This means that I start with a light shade and that in this first printing little or none cutting is done. Next follows the cutting: with gouges I cut away other parts of the wood, the I print anew, but now in a slightly darker colour and this continues on and on. Printing, further cutting, printing … At the end little of the image is left on the wooden plate, only the darkest colours can still be printed. With this technique a print can obviously not be reprinted. The-end-of-the-year-prints were mostly done in a different way: for each colour a new plate was made (on average 4 to 5 plates per print). The work plans were easier to make due to the smaller format. During the printing process I decide about the colours. Most cards can still be reprinted. The style of my work is characterised by frugality: geometric, rigid, not romantic. There needs to be a play of planes, without perspective, graphic. 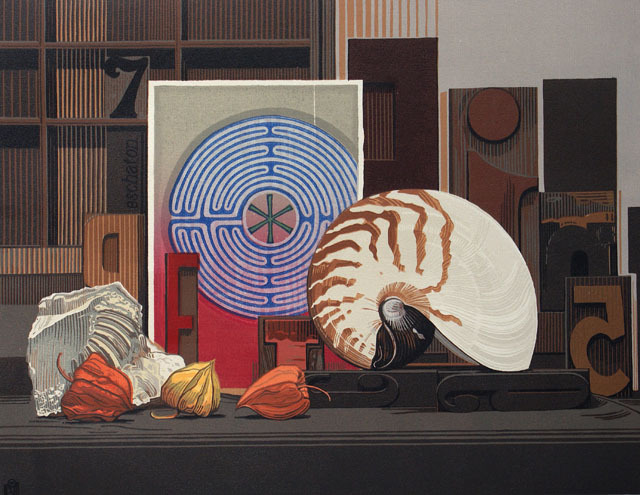 Composition with Labyrinth and Nautilus. In Composition with Labyrinth and Nautilus the Nautilus shell plays a central role. Due to resemblance in form and line pattern the shell refers to the labyrinth, which can be found in the Gothic cathedral of Chartres (France). One passed through this labyrinth while praying, meditating or doing penance. The labyrinth represents the path of life – at the end one reaches the center, which represents heaven or also Jerusalem. In the middle of the labyrinth/the world one finds the Christ monogram, which calls to mind the medieval image of Christ as world ruler or Pantokrator. Finally the colours red and orange endow this image warmth, love and life. I want to arouse wonder about all sorts of things in the world surrounding us. The object as such definitely also has my interest. This is shown by my small collection of natural objects. Some shells served as a source of inspiration: in the Still life with Labyrinth and Nautilus for instance I used several objects from nature such as little lanterns, but also a stone with a fossilized print. Isn’t a shell a delight to view after all? Inevitably that vision comes out when one looks at prints like Still life with Labyrinth and Nautilus or the Tree of Life. In this we get a small glimpse of the new heaven and the new earth. From time to time I want to show in my prints what life is REALLY about, as I did in Tree of Life. This is based on an image of a medieval ‘garden of paradise’. 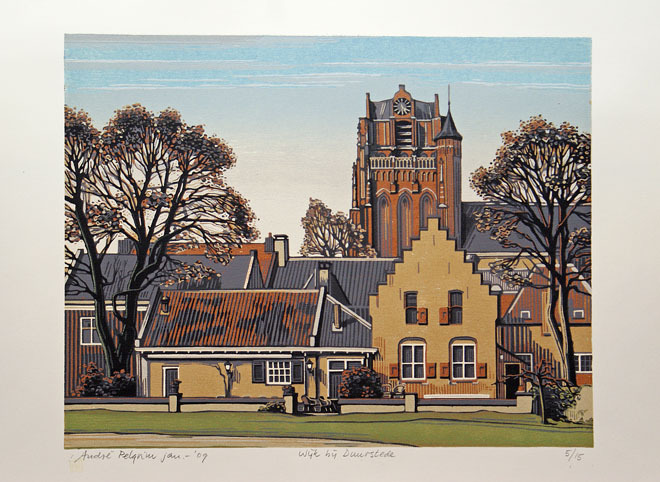 My work is mainly represented in private collections and in the art libraries of Maassluis and Vlaardingen, while the biggest collection is in the municipal archive of Vlaardingen. Also the munipical archives of Schiedam and Rotterdam own a number of works.